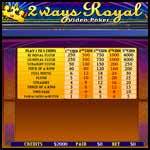 2 Ways Royal is an exciting single-line video poker game. The object of the game is to secure a 5-card poker hand that features a winning combination. In order for you ladies to get a better understanding of what we mean by a winning combination look at the following examples. A Lo Royal Flush is a winning combination compiled of 2, 3, 4, 5, 6 of the same suit. A Hi Royal Flush is a winning combination consisting of 10, J, Q, K, A of the same suit. In order for you ladies to get a better understanding of what we mean by a winning combination look at the following examples. A Lo Royal Flush is a winning combination compiled of 2, 3, 4, 5, 6 of the same suit. A Hi Royal Flush is a winning combination consisting of 10, J, Q, K, A of the same suit.